Ink and Lace with Sheryl Cauble: Shout It from the roof tops! New Digi Release! Shout It from the roof tops! New Digi Release! Hello to all of my crafty and very talented friends! I love these very versatile new digi's! Heather has designed one for every occasion! so that you can personalize it! The blue scalloped edge is a MFT dienamic die also. I used it because it reminded me of clouds. I used my sewing machine to give my card a more finished look. and I apologize because my printer was low on ink. I traced over the letters with my ink pen, so the words didn't come out nice and clean. from my dear design team friends. order your own digi images. for so many special occasions! It's been pouring rain here for days now and its cold! We actually had to put our heat back on and start wearing coats and long sleeves again! I peeked through the crack in my deck and the Robin eggs haven't hatched yet. They are probably waiting for the sun to shine first! My garden is growing and all of this rain is encouraging lots of weeds to sprout! Ugh! I'm not a big fan of weeding! special newborn grunts and stretches that he makes! He cracks us up because he always makes a boo boo face when he burps! I love how you've tied the cord through the centre of your button! 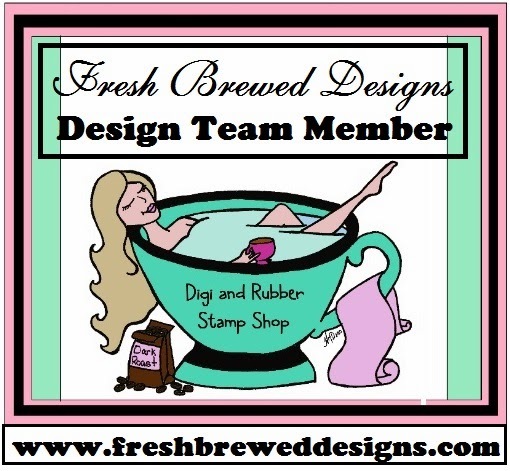 The Design Team are really pleased that you joined us for the Simon Says Stamp and Show Challenge this week - Thank you! Great card, love the papers and the colors. so much goodness from the inside and out! i especially love the front with the houses in a circle: perfect! hope you're feeling better. thinking of you. hugs! Oh how fun!!! This is one fabulous card, inside and out!!! I too hope you are feeling better. Such a sweet card, lovely image. Thank you for sharing your work with all of us at Crafty Boots Challenges. Wonderful card! Thank you for playing along with The Pink Elephant Challenge! Fab card Sheryl! Love the images and that gorgeous bow. Hi Sheryl, thanks for stopping by and leaving such a lovely comment. I've just had a nosey and your cards are fab! I'll be back often! This is a fun new digi! Love how happy and sweet your card is and the inside is wonderful. I need to spend more time on the inside of my cards! Thanks for the sweet comments on my blog! Hi Sheryl! Thanks so much for your sweet comments on my blog. :-) Your card is so bright and cheery. The little house image just makes you smile and those felt clouds are cute as can be. Hope you have a wonderful week! Hugs!